A court in Illinois has ruled that passengers injured in the crash of Emirates flight EK 521 from India to the United Arab Emirates have the right to sue aircraft manufacturer Boeing in the United States. Judge Patricia O’Brien Sheahan in the Circuit Court of Cook County Illinois ruled against Boeing’s motion to dismiss on grounds of forum non conveniens on 26 September, finding that public and private interest factors in the case did not strongly favour dismissal. Flight EK 521 overshot the runway at Dubai International Airport on 3 August 2016. The flight crew, following guidance provided by Emirates and approved by Boeing – according to plaintiffs’ law team – allegedly tried to correct the error by bringing the 777 jet back into the air to make a second attempt at a safe landing. Plaintiffs’ lawyers said the manoeuvre should have caused power to flood back into the engines but as the wheels had already touched down this process was inhibited and caused the aircraft to crash. A fire broke out on impact and crew evacuated passengers before the aircraft’s centre fuel tank exploded. According to the decision, the complaint stems from injuries 14 plaintiffs claim they sustained when the aircraft “fell violently back to the ground” during the failed landing manoeuvre, which they argue was caused by a defect in the Boeing aircraft. The plaintiffs – who are alleging negligence and product liability on the part of the engine manufacturer – are represented by Stewarts partners James Healy-Pratt and Peter Neenan in London as well as partners Floyd Wisner and Alexandra Wisner at Wisner Law in Chicago. Neenan told ALN that, in the US, plaintiffs have the right to pursue “responsible parties” in any forum where they can establish jurisdiction against a defendant. The burden to demonstrate that the forum chosen is inconvenient to the defendant and that another is more convenient to all parties lies with the defendant, he added. The plaintiffs were spread out across several jurisdictions, including the UAE and the United Kingdom, and none of them are resident in Cook County, nor are they citizens of the US or UAE. Nevertheless, US law usually gives deference to the plaintiffs’ choice of forum, and the court found that no forum was “substantially more convenient for all parties” than Illinois. Private interest factors considered by the court included the convenience of the parties and relative ease of access to evidence, the ability to compel unwilling witnesses to testify and the possibility of viewing the accident scene, alongside other practical considerations. Boeing had tried to persuade the court that the UAE was an appropriate forum for the dispute, arguing that evidence related to the crash, including testimony from the airline and airport, was held in the country and was necessary to both parties’ cases. The plaintiffs responded that much of the evidence is already publicly available and that evidence from other relevant jurisdictions, particularly the UK, would be easier to obtain in a US court than one in Dubai, as the UAE does not recognise the Hague Convention on the Taking of Evidence Abroad. 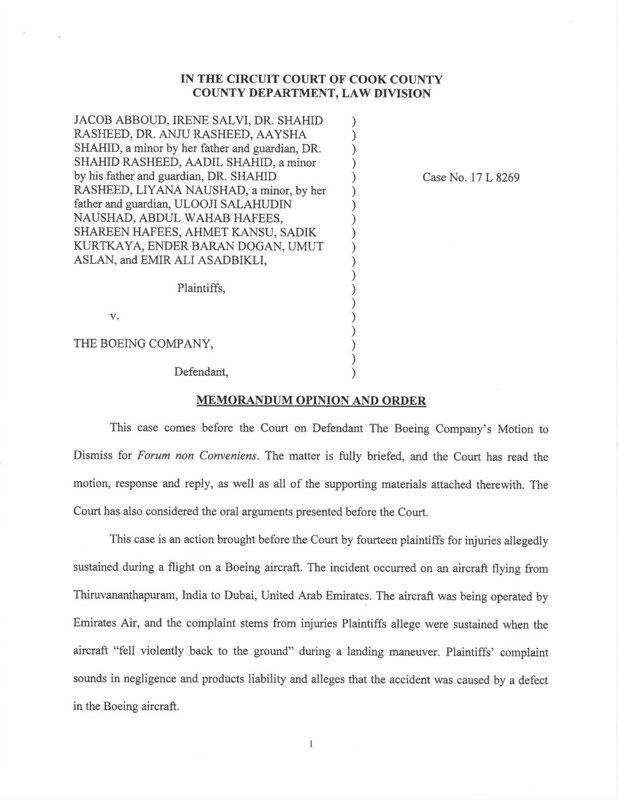 The court was sympathetic to Boeing’s argument that its rights would not be protected in a forum that lacked jurisdiction over Emirates and its staff, who the manufacturer said were responsible for the crash, as this would leave it open to third-party actions, but dismissed as “largely speculative” the possibility that UAE nationals connected to the airline would be unwilling to testify in the case. The public interest factors considered by the court included interest in deciding localised controversies in a local court, the unfairness of imposing expenses and the burden of jury duty on residents of a county with little connection to the case, and that court dockets in the US were already congested. However, as the case concerns product liability and Boeing’s planes are flown internationally, it would be hard to find a jurisdiction where citizens did not have a vested interest in the case, the court said. The US Supreme Court had previously emphasised the importance of a “factual connection” to the forum, which the court found lacking in this case, but said the connection to the UAE was not “overwhelming” either. On balance, the judge ruled that Boeing’s motion to dismiss based on forum non conveniens wasn’t persuasive and threw the petition out. Neenan told ALN that it is “not yet clear” whether Boeing will mount an appeal. Once that has been determined, a timetable may be set for trial, he added, noting that “recent statistics in Illinois indicate that cases take an average of 35 months from filing to verdict”. In a statement, Neenan noted that the plaintiffs “are not critical of Emirates and feel that the crew performed heroically in the evacuation”, emphasising that “their claim is against Boeing for a switch that, without warning, did not function as expected”. “This is only the first stage in this claim,” Floyd Wisner said, adding that the manufacturer had “made it clear” it disputed that the accident, which he deemed “avoidable”, was its fault. Neither Boeing nor Emirates responded to ALN’s requests for comment.